This is the full text of Jeremy Corbyn’s speech at Bloomberg in London today. In the wake of the referendum vote to leave the European Union … and a summer of political turmoil … our economy stands poised between two alternative futures. There is huge potential in our society …. There are talented people across the whole country … The millions who want a decent job, or to set up in business… or use their skills for the wider social good. In every single part of our country … the potential exists …. to do so much better than we are doing. But we have an economy … and a set of institutions …. that has let people down badly. We can already see one future that’s being laid out in front of us. You can see it in microcosm in Shirebrook, in Derbyshire. This is a once proud mining community that was devastated by pit closures. Good, secure jobs were lost, when the colliery closed in 1993. For a decade, the town was left to stagnate …. And then, directly on the site of the old colliery …. Sports Direct opened its huge warehouse in the early 2000s. There were jobs on offer … but they were the worst of the worst … Zero hour contracts … and wages below even the abysmal legal minimum. Health and safety on site was cut to the bone … In just two years, ambulances were called to the site 76 times … One woman was forced to give birth in the toilets, she was so terrified of losing her job [it was alleged – editor’s note]. These were conditions that would shame a Victorian mill-owner, right here in twenty-first century Britain. A long-running campaign … by workers led by the trade union Unite … exposed the abuse. Publicly shamed, chief executive Mike Ashley has now promised to improve conditions. But there are other Sports Directs out there. This isn’t just about a single bad boss. The failure at Sports Direct is the failure of an entire economic model. We have built an economy where the fast buck takes precedence … over the long-term, patient investment that will deliver good quality jobs. Instead of changing direction … this is the future we are drifting into under this Conservative government. The number of workers on zero hour contracts leapt by 20 percent in the last year. Real hourly pay has fallen 10 per cent since the crash …. the worst performance of any developed country, bar Greece. Meanwhile, the worst austerity spending cuts for generations … have eaten away at our public services …. and yet still lead to rising levels of government debt. This is the future the Conservatives hold out for us … A mean-spirited vision … that will squander talents and skills … and deprive people of opportunities that should be theirs to enjoy. But this vision is also the path of least resistance … and that is why this directionless government is happy to settle for it. They wandered, unprepared into Brexit … And now they are scurrying away from the mess that have caused. The Chancellor of the Exchequer has all but shut up shop … Philip Hammond is refusing to clarify the government’s own fiscal position … when assurances are needed in the wake of the leave vote. Even as it is becoming clear that monetary policy is reaching the limit of its capacity … the Chancellor is seemingly still content …. to stick to George Osborne’s plans for spending cuts. With capital costs for government the lowest in our history … it simply beggars belief that any responsible government … would actually be seeking to cut public investment. But that is what appears to be happening … For Philip Hammond to carry on cutting investment … is an act of unpardonable folly. Labour is calling on him to immediately reverse planned cuts in public investment … and bring forward projects that will create jobs and support the economy. The new Brexit Secretary, meanwhile … has been unable to answer simple questions on the government’s own negotiating position … even as the Prime Minister has been busily disavowing the promises made during the referendum campaign. Theresa May herself has been long on rhetoric, but short on direction. “Brexit means Brexit,” apparently. But what does that mean? The distance between the enormity of the challenges … and the paucity of the vision on offer … is striking. Instead of a vision for the future, the boldest policy offer from this government … has been to resurrect the proven failure of grammar schools. There could be no clearer indication of the Conservatives’ failure to rise to the level the situation now demands. They are retreating to a 1950s fantasy world that is totally out of touch with modern Britain. Under Theresa May, Britain is being left on hold. And that has immediate consequences … It means the uncertainty around Brexit is prolonged … Business investment plans are paused, or even cancelled. Companies reconsider their commitments here. Jobs are placed at risk. Yet this Conservative government is performing the political equivalent of pulling the duvet over their heads … and hoping it will all go away. The complacency over the Brexit negotiations is extraordinary and a matter of growing concern wherever you stood in the referendum campaign. We accept and respect the decision of the British people in the referendum to leave the European Union. We have set out our red lines for trade, investment, jobs, investment and environmental and social protection in the negotiations for a new relationship with Europe. We will be pressing for full access to the European single market for goods and services as part of those negotiations. We should not be falling back on a World Trade Organisation-only trade deal with Europe as that would potentially risk damage to the public finances and significant job losses. But there are directives and obligations linked to the single market … such as state aid rules and requirements to liberalise and privatize public services … which we would not want to see as part of a post-Brexit relationship. What is essential is that the government brings forward its own agenda for those negotiations to parliament as soon as possible. The overwhelming fact of the vote to Leave the EU … is that the status quo is no longer an option. In voting Leave, in communities across the country … rejected the status quo that had failed them. This is the failure of an entire economic model to provide the chances and opportunities to a generation of our people. It is an economic model that has discarded good jobs and stripped whole communities of their pride. Promoted for decades this model argued that if taxes were slashed taxes for big business and the mega-rich … then everyone would benefit. But it has too often meant poverty pay, zero-hours contracts, and lives ruined by a shortage of affordable homes. Instead of trickle-down, we have seen a monstrous trickle-up of wealth and opportunities. Too much wealth became concentrated in too few hands in too few places. And former Chancellor George Osborne’s political choice to impose austerity on top of this … meant not only the worst spending cuts in this country for three generations, but a slump in living standards for most. Eighty percent of households have seen either no increase or falling incomes since the crash. Andy Haldane, the Bank of England chief economist, has spoken of a “lost decade” of earnings. The Leave vote, for all those in left-behind Britain, was a decisive rejection of all this. We in the Labour Party campaigned in the referendum for a vote to Remain and Reform. 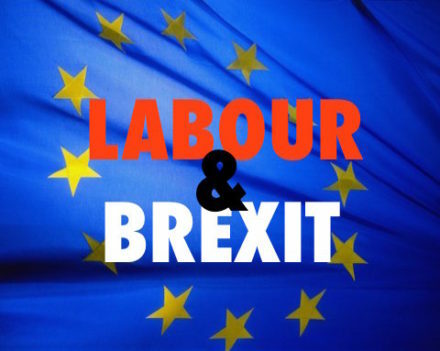 The large majority of the labour movement and Labour Party … were clear that the European Union helped protect workers’ rights and secure economic prosperity. But our arguments did not carry the day … We now have to set out the the best possible future for our country after the Leave vote. One that defends hard-won rights for working people. But one that also stakes out a bold new vision for our economy can work for all of us, and not just a privileged few. We have to present to the country … and in particular those communities in left behind Britain … our alternative. We must build the consent for this new model. As a country we must have a proper, informed debate … That requires this government to make its own intentions clear. No backroom deals and secretive negotiations behind closed doors. Parliament and the whole country must be fully informed. I want now to lay out my vision for how our economy can work for the many, and not for the few. Of a new, dynamic economy that breaks with the failures and injustice of the past. There is an alternative to the Tories’ drift and failure … This is the better path for our economy to take. The challenges are substantial. Ours is now a low investment, low pay, high debt economy. The pattern since the crash of 2008 has been very clear. Investment has fallen, and it has been too easy to substitute cheap, expendable labour for investment in machinery, new technology and infrastructure. The result is that our economy has become very good at generating poor-quality jobs – so that over half of those in poverty are now also in work. Deindustrialisation has helped kill off many of the relatively secure, relatively well-paid jobs that manufacturing industries support. For too many the alternative now on offer, especially for the young, is low pay and insecurity. This is a desperate situation for those pushed into zero hour jobs … particularly where they are also forced into overpriced and insecure rented accommodation. But it also means the base of our tax system is steadily eroding. If the super rich are opting out of taxes on one side … and too many people are too insecure and too poorly-paid to carry a tax burden on the other … we cannot continue to fund the high-quality public services we need and want. The spread of automation, meanwhile, is now starting to eat into previously secure, middle-class jobs, as even complex tasks become computerised. The Bank of England has suggested that up to 15 million UK jobs could be at risk from automation over the next decade. And the IMF, like other forecasters, now expects growth to be very weak across the developed world. The IMF cites low investment, the weight of private sector debt, and longer-term productivity and demographic issues …. as bearing down on the growth potential of advanced economies especially. Our heavily-indebted societies are more vulnerable to financial shocks than they were. All of this presents a deep challenge to the social democratic and socialist tradition that Labour, New or Old, has always been a part of. It punctures the old belief that it was possible simply to redistribute the proceeds a growing economy to pay for public services. It can no longer credibly be argued, for the majority of people, that free trade and free markets alone will deliver increased prosperity. A future Labour government will have to do more than redistribute income and wealth … It will have to focus on how we earn that income and wealth in the first place. Above everything, we have to address the need to rebuild and transform how our economy works. At the centre of this transformation is the need to deliver investment. It is investment in new equipment and new machinery, and new technology and new ideas that can deliver rising productivity. For government, that means making a serious, long-term commitment … to overhaul and rebuild our infrastructure right across the country, to unlock its potential. Not just talking about a “Northern Powerhouse”, but delivering on it … Not just putting on a high-vis jacket for a photoshoot, but making sure every community is part of the transformation. That is why we have pledged a £500 billion investment commitment. Our investment pledge will fit completely within the clear framework provided by our Fiscal Credibility Rule. Labour’s Rule, announced by Shadow Chancellor John McDonnell and drawn up with the help of world-leading economists, gives government the capacity to invest whilst delivering financial stability. If we want high-quality public services, we have to create a high-quality economy. We’ll use record low capital costs for government to make that happen. Delivered through public capital spend … and the new National Investment Bank and regional development banks … this investment programme will be on a scale that will transform how our economy operates. We’ll build new, democratic institutions with clear public service mandates to ensure every part of our country gets the investment it needs. We will take power out of the hands of a few elite circles in Westminster and the City of London, and give communities across the country the ability to shape their own destinies. We’ll end the culture of short-termism and quick bucks that have dominated our economy, and restore pride and dignity to left behind Britain. It is time for our local communities and our regions to take back control. The old default … pretending the market alone will deliver … is no longer feasible. World trade has consistently grown less rapidly than the world economy, and even, over the last year, began to shrink. Mega trade deals, like TTIP and CETA, have hit the buffers. The old rules of globalization … in which manufacturing would rush to wherever labour was cheapest … are being rewritten. For decades or more, the squeeze on manufacturing employment has been relentless, as millions of new workers were added to the global labour force. But after years of plant closures and steady employment decline, one in six UK manufacturers report bringing some production back into the UK. This is “re-shoring”, driven by the need for sophisticated manufacturers to locate close to their markets and draw on highly-skilled labour. The economies that are navigating this switch successfully … are not the ones where governments are taking the hands-off approach. Governments across the world are breaking with the old model, and choosing to intervene in their economies. When the steel crisis broke, as cheap steel – mainly from China – flooded the world market and undermined their domestic industries … major governments chose to intervene. The US pushed up tariffs on imported steel to 266 per cent in some cases. Italy moved to nationalise a steel producer. Germany increased its subsidies. The EU as a whole attempted to introduce sharp tariff increases. They were, however, held back by our own government, which clung to the old free-market dogma. Free market ideology counted for more than a prosperous economy. Eventually, under pressure from unions and the Opposition, the government was forced to say that yes, the UK government could also take a stake in British steel producers. The lesson here is simple: Successful economies need governments prepared to back them up. Good business needs good government, not no government. This isn’t just about just protecting essential industries … Successful economies today are those that have a government prepared to stand up and support new businesses and create new opportunities. Germany’s “Industrie 4.0” programme is intended to maximise its capacity … in order to profit from the “fourth industrial revolution” – the digital transformation of manufacturing and engineering. Deloitte’s Manufacturing competitiveness index shows the US racing ahead, overtaking even China, on the back of its commitment since 2009 to deliver investment in research, new technology, and innovation. Without similar commitments, our own economy will start to slip further and further behind. But our economy lets us down badly in the provision of skills, and the provision of digital infrastructure. Our broadband access is amongst the slowest and most expensive in the OECD. And our schools are overwhelmed by testing. Our further education system has been whittled to the bone. Adult learning slashed. And our universities charging higher and higher fees. So as part of our infrastructure investment commitment, we want to see superfast broadband delivered to every part of the country. We know this can make a difference. The turnover of Cornwall’s digital sector grew 153 per cent in the last year, well ahead of London. The local press have started saying Cornwall can be “Britain’s Silicon Valley”. This is on the back of a £136m EU-funded scheme to introduce high-speed broadband. That’s how we can start to turn around those parts of our country that have suffered underinvestment for too long. But we also need to address the skills shortage that so many employers now cite as a major barrier. That’s why a Labour government will look to create a National Education Service, providing the best possible education for all. Instead of Tory tests and segregation at age 11, we’ll make sure that every single person has the opportunity of education … so that every single person in our society can meet their full potential. It’s education that will help deliver the high-technology, high-investment economy of the future, right across our country. We’ll remove the false distinction between training and university … and reinstate adult education. Education should be valued in this country in the same way we value our NHS. We also invest too little in scientific research. As other countries are looking to increase their investment in science and technology, Britain has no clear plan to do the same. I want to see this country move towards the OECD target of 3 per cent of GDP spent on scientific research, from all sources. We can start by doubling energy research, in line with the recommendations of Nicholas Stern and others, overturning what has been a 95 per cent decline in energy research spending since the 1970s. The next Labour government will set up a new Advanced Research Agency, modelled on the success of the ARPA-E energy research agency in the US … to bring together the best minds in the Britain and the world … to make the technological breakthroughs our future low-carbon economy will need. We can invest in renewables to create over 300,000 high-quality jobs across the courtesy, and make Britain a world-leading renewables producer. I am delighted that we now have a Labour London Mayor. I know Sadiq shares my desire to ensure that London does not fall victim to the indecision coming from Downing Street on how we secure our economy from the effects of Brexit. Sadiq and I have known each other for many years, often agreed and sometimes disagreed. But we are always united on what is best for Londoners, and the importance the city plays in our economy. My door will never be closed to him. And I will stand shoulder-to-shoulder with Sadiq Khan in protecting London from the risks it faces from a Tory-led Brexit Britain. We’ll introduce a comprehensive industrial strategy to deliver a high-investment, high-skill, high-technology new economy. … working with businesses, trade unions and communities to deliver proper sectoral support. Our car industry was turned around from the depths of the 2008-9 recession by effective government intervention and collaboration. Britain today exports more cars than ever before in its history. But as well as finding new ways of working together, it means looking to change some of the rules. In light of the Leave vote, and the coming negotiations with the European Union, we should take the opportunity to reassess some of those rules in light of the challenges we face. We cannot be afraid of intervening directly to support supply chains and new industries. Any deal with the EU must recognise that the old state aid rules are no longer valid. When governments across the world are intervening, it makes no sense to tie a government’s hands here. The evidence is clear that strategic, careful interventions can make a difference. Key amongst these is government procurement. As is becoming widely recognised, governments can help create new markets and promote innovation. We will insist, as part of our infrastructure investment programme, that high-quality British-sourced steel is used. One recent study suggested that even a 1 percent increase in UK government procurement … in essential industries like steel and chemical can produce a 19,000 jobs boost. And if we are aiming to generate 65 per cent of the UK’s electricity from renewable resources by 2030, making use of our huge natural advantages, we’ll be able to create hundreds of thousands of jobs. With government investment and support for supply-chains, we estimate that well over 300,000 high-quality jobs can be created in our renewables industry. We can make Britain a world leading producer in a market that Bloomberg forecasts to be worth $630 billion globally by 2030. The changes needed go deeper than just improving how government functions. Our corporate structures are not meeting the challenges, or matching up to the opportunities. Whether it is scandals like the asset-stripping of BHS, or the abuse we saw at Sports Direct, it’s clear that corporate governance needs overhauling. It is too easy for unscrupulous bosses to exploit and ensure that the flexible workforce is only flexible for them, not working people. We have been clear that we will strengthen employment and trade union rights … We saw just the other week the sharp rise in maternity discrimination experienced by women. We will strengthen and extend collective bargaining in our economy … and abolish Employment Tribunal fees to enable greater access to justice for those that experience workplace discrimination. This is why as Labour leader I have launched Workplace 2020 …. to create a positive framework for employment and trade union rights. Migrants have often been the worst exploited – and have been unacceptably scapegoated for the actions of bad bosses … That the Government that has nurtured this insecure, precarious labour market … to also actively participate in this scapegoating is unacceptable. It doesn’t work to claim to be “preventing” migration. This government has managed to miss every target it ever set itself. Everyone deserves protection at work. So the next Labour government will ensure that every new National Insurance registration receives details on how to join a trade union. We’ll change the incentives for Britain’s bosses … so that it is easier for decent employers to do the right thing and invest in the long-term, whilst cutting out the abuses. I’ve called for a “Philip Green Law” that would bar asset-strippers like Green from loading companies up with excessive debt, and paying excessive dividends. We’ll tighten up the Takeover Code … so that it takes better account of the impact on current employees and pensions … We want to see clear plans to support both, before takeovers can be allowed through. We are the fifth richest country in the world. If you are in the top 1 percent in our country you are doing better than almost anywhere on the planet. Senior members of my party used to say they were, and I quote: “intensely relaxed about people getting filthy rich as long as they pay their taxes”. The problem was that while those in my party were relaxing many of those “filthy rich” were not paying the taxes they should have been. Instead, I want to be relaxed in the knowledge that our fellow citizens are living rich lives, and for our economy to be working for people. And not working against them. Because the truth is that at the moment the economy is rigged against working people. I want to unrig the system. Oxfam has raised the issue of pay ratios this week and should not be ignored by politicians. This is something I am extremely interested in and we’ll be looking at ways to address the huge disparity in executive pay compared to ordinary workers. Unlike big multinationals, working families do not tend to have huge cash piles to fall back on when times are hard. They cannot borrow at record low rates to invest in their future. Or cut sweetheart deals with HMRC. The responsibility of government is to protect citizens from these growing uncertainties in our economy, not exacerbate them as the Conservative government has done. It is one of the reason I am looking at policies that can help provide more security for working households. One such possible answer may be the often discussed suggestion of a universal basic income. But we need to research and test this policy before we can just adopt it. That is why I am looking at the party holding a review to consult widely on this policy. But more than just making sure our existing corporations work better, we should be looking to overhaul how our businesses function. Not just worker representation on boards, but worker ownership of companies. The productivity benefits are clear, with worker-owned companies typically being more productive than those that are more traditionally owned. Labour will look to create a “Right to Own”, giving workers facing a change of ownership or closure of a firm the first refusal in putting together a worker-owned alternative. The regional development banks will be given the task … alongside assisting small businesses generally … of providing the finance to make worker ownership and co-operative ownership a reality across our economy. I want to see local councils building on the example of Preston, where a focus on using local government procurement … has helped support the local economy with real investment and sustain co-operative local enterprises. But we can go further than this … I want to see a new, co-operatively owned ‘British Mittelstand’ created: high-investment, high-productivity smaller firms that provide high-quality employment in those sectors where we have the greatest potential: digital technology, healthcare, high-value added manufacturing. I want to see co-operatively owned renewable energy companies driving the transition to a low carbon economy. New technologies and new business models … backed up by government investment and shared industrial strategy. There is an alternative to the drift and decay of the Tories. An economy that works for all, across every part of our country. Investment by government to provide the high-quality infrastructure a modern economy needs … and a new dynamic relationship between government and industry …. based on a strategic innovative approach. A new National Investment Bank and regional development banks to deliver funding across the whole country. A National Education Service to provide the training and skills for everyone. An industrial strategy to provide support for essential industries and pave the way for those of the future. A commitment to decarbonise our economy, making Britain a world-leading renewables producer. Major businesses that look to the longer term, and a labour market that does not exploit workers. And a new generation of co-operatively-owned enterprises, transforming how our economy functions and sharing wealth more evenly. We can and we will rebuild and transform this economy….so that no one and no community is left behind.